Keeps small parts neat and organized during transport. 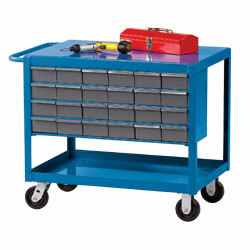 Rugged, durable cart withstands heavy use. Welded push handle maneuvers cart. Features 5"W x 12"D x 3"H small parts storage bins. Gray bins include 2 adjustable dividers. IN STOCK. XT-1587 180	 24	 2	 7-5/8"	 36" x 24"	 32-1/2"
XT-1594 240	 48	 2	 7-5/8"	 36" x 24"	 32-1/2"